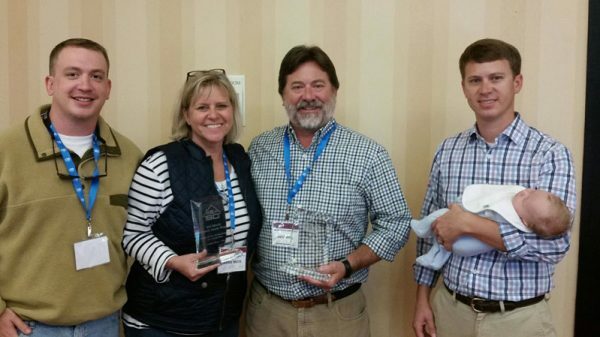 On Friday, October 23, at the HBASC State Convention in Asheville, N.C., Saluda River Club, the most successful residential community in South Carolina located on the banks of the Saluda River, was honored by the Home Builders Association of South Carolina (HBASC) with the Pinnacle Award for 2015 Community of the Year. The annual event celebrates outstanding craftsmanship in the construction and remodeling of quality homes and excellence in sales and marketing tools. Saluda River Club also received the 2015 Pinnacle Award for Best Interior Merchandising for the Monterey Showcase Home. During this event, Andrew (“Andy”) White, the developer of Saluda River Club, was elected President of the Executive Committee of the HBASC. The Executive Committee conducts the affairs of the Association in accordance with the bylaws, policies and instructions of the Board of Directors and acts as the Steering Committee of the HBASC. Saluda River Club offers excellent, well-crafted homes in a beautiful natural setting in three distinct neighborhoods, The River District, The Village District and The Woodlands District. The community, close to Columbia’s major medical facilities and the University of South Carolina, is renowned for its luxurious amenities, including the Chickawa Outdoor Center, the Village Clubhouse, clubs and activities, river access, trails and parks, plus its location in one of the best school districts in the state, Lexington School District One, make this a highly-desirable community for young professionals, growing families and empty nesters alike. The Pinnacle Awards are open to all members of the HBASC. All entries were completed during the 2014 calendar year. To learn more living at the award-winning Saluda River Club, please schedule a visit soon. For more information or directions, please call 803-358-3969 or visit www.saludariverclub.com.